I can now tell you about the book I have been working on over the last year. A copy has just arrived on my doormat, which is a totally thrilling experience. And it is on a topic which is totally different to my normal line of work. 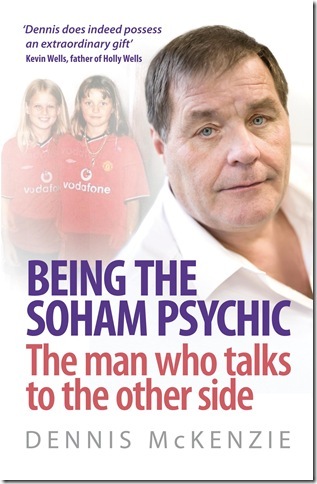 When I am asked this, I reply that I believe in Dennis McKenzie, best known as the “Soham Psychic” for the chillingly accurate readings he gave the devastated, grief stricken parents of Holly Wells when she went missing with her friend Jessica Chapman, and both girls were murdered. It was a tragic story which sent shock waves around the world. Dennis’ amazing life story – as well as gripping accounts of his other paranormal experiences – are being published on 3rd September by top publishers Headline. It is called Being the Soham Psycic, the man who talks to the other side. This is a book which I have ghost written after meeting Dennis for a personal reading at his home near Cambridge. I took him at his word when he said I should step out of my comfort zone and take on a new challenge. “Perhaps I should write a book about you,” I said, as I walked out of his house and down his front path. He instantly agreed. At the time of my reading back in December 2007, one of the cases Dennis had worked on was splashed in the national press and he showed me the headlines. It was about a teenage boy whose body had just been recovered from a lake weighted with concrete. His name was “Happy” Kelly and he had been the victim of a gangland killing in Limerick, Southern Ireland. Dennis has helped many families who lost sons to gangland killings over there when they felt they had nobody else to turn to. Dennis also told me about his visit to America with a documentary team to work on the terrifying case of a serial killer who had been murdering over 30 years and was still on the loose. This man was known as BTK because he bound, tortured and killed his innocent victims. Dennis was able to give police a totally different psychological profile which was found to match him perfectly after he was caught. I instantly thought these stories would make a great book, and that his story was unlike that of any other psychic. I felt that Dennis, who had also been Woman’s Own resident psychic, should tell his story to the world. It really is unlike any other psychic’s book because Dennis speaks in a no-nonsense blunt and honest way which people appreciate, yet with compassion too. I believe he is extraordinary and possesses a unique ability to communicate with the spirit world. The book also includes Dennis’ experiences of transfiguration, reincarnation and regression. I promise it won’t disappoint. It will be available from all the leading bookstores, as well as supermarkets and Amazon. It can also be ordered from my website by clicking the pic of the book cover at the top right panel of my site. Many thanks to Carly, Josh, Helena and everyone else at Headline for doing such a great job. And thanks again to ace blogger, and superb author and ghost writer Richard Havers who helped make this happen for me by recommending me to his literary agent. I made comment and aske dthis next question in 2009-why hasnt Mckenzie applied for JREF million dollar challenge? A million pound !He could give it to charity! Iwas given reply”Its explained in the book” to which I asked for page reference,Im still waiitng. Dennis Mckenzie isnt psychic,there is absoluetly no doubt of that. Existence of the paranormal depends upon the belief of the person. I believe in the paranormal, therefore it exists. We are given the free will to choose our own decisions like to believe something or not. Something exists when a person truly believes it by heart but it will never be a reality even if there is only a tiny tinge of doubt. Certain events are not possibly seen by the naked eye, and so we need others to do it for us. The book sounds very interesting. Congratulations on taking that step out and for your achievement. Well done Ellee, it’s a huge achievement I look forward to reading it. Sorry to come so late to this post, Ellee. Many congratulations and you have every right to be proud of your achievement as I, as a friend of yours , am proud of you. I don’t know whether I believe in psychics or not, just as I don’t know whether I believe in God or not, but that doesn’t stop me reading about either! What I would like to ask someone like Dennis is, if people can communicate from beyond the grave, why don’t they communicate with their loved ones? It seems kind of cruel not to. I can’t see what the objectors above are getting so vehement about: whether Dennis is “genuine” or not, he has an interesting story and I can’t wait to read the book! Btw, what are MB’s academic credentials, then? Anyone who has met Dennis will tell you that his eyes are the most startling and incredible eyes you can imagine. They are described in the book. I think the word ” unflattering ” would be correct on the book cover photo ! It gets no better on his own web site though!. Is it just me or does Dennis Mckenzie have really beady eyes. They’re kinda freaking me out. I’m also quite skeptical. I feel that those good ‘mystics’ are tapping into some sort of telepathy from the client or those involved with the client rather than communicating with the dead. Do they ever say “I’ve hidden the gold in the cellar ?” and it’s found ? And that no-one else knew about it ? A common phenomena occurs with pets that seem to know when an owner is coming home half an hour before they do. Our dog (when I was a child) would get restless and jump at the window often twenty minutes before my father would walk in the door – regardless of where he’d been. It seems to me that they garner information someone already alive knows about. I believe that the ‘spirit’ is simply an illusion in the living body created through biology and chemistry. And that it dies with the body. Oh dear Ellee have just look at the mans web page ! Clearly being a ” psychic ” is a good money making activity . Card readings , your history through the simple action of giving your full name and date of birth the list goes on . The worse thing was the claims that you could be put into regression to prove that weve all lived before , utter bunkum . Actually I reckon most of us given the types that will go to someone for such mumbo gumbo could also manage to give them facts that must come from the otherside ! The other side of reality that is. In the case of missing children it is already a well known and recorded fact that most will sadly be killed within a few hours , hardly requires a crystal ball ( or a spirit guide )and Soham is only a few miles from Cambridge and many of us could hazard a good guess at a childs favourite shop there if we also lived close . Sorry I dont go for any of it. Liz, that’s a very fair comment. I hope you enjoy it and I look forward to hearing your views. Fee, lovely to hear from you, and I hope you had a great summer. Take care. Elvis, Jo and Fee, thank you for your interest and I hope you do enjoy the book. Kevin, I hear what you say, and thanks for the link. Glad to hear you think there is something in it. I guess every industry has charlatans. I can only vouch for Dennis. WW, Dennis had paranormal experiences as a young child and his first vivid memory was at the age of four when he was in hospital. It was many years later before he realised that not everybody had similar encounters with the spirit world because they happened to him so regularly. Ellee, i am open to all different kinds of thoughts and beliefs and respect other people’s points of view. Until i have read your book it would be unfair ot even dream of making a comment about it. I will be ordering mine soon and very much look forward to reading it! Well done. When did he realise he was psychic, Ellee? 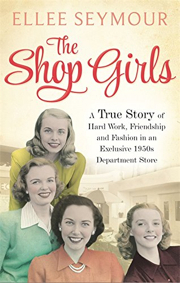 Ellee, I am very excited to read this book when I return to the UK, my copy has already been pre-ordered! You know how sceptical I am about many things, Ellee. Yes I do think there’s something in it. Most of them are charlatans though. I am a quite sceptacle myself, but it must have been a very interesting project for you Ellee. So-called psychics prey on vulnerable families of missing people. They are frauds. You ought to be ashamed off yourself for helping one to publicise what he has done. If this man is a real psychic then why has he not won $1 million from James Randi? Randi who has brought attention to, and even exposed, such fraudsters for decades, many of whom have caused great anguish to families of missing children with their lies. I am surprised at you Ellie, I am really shocked. Gullibility rules. Cold caller conmen will be beating the path to your door. Watch out Mr Seymour! You’ve got a problem. And so you should be proud of your achievements! I hate rude negative commenters who won’t identify themselves properly. I think the book sounds fascinating and in answer to your first question, yes I believe these things are possible. Captain Picard, I naturally agree it is good to discuss differing views, especially on a controversial topic such as this. I also know this is a subject which fascinates many people, both men and women. I hope you will read the book. MB was rather abusive on the above comments. I think these things are always interesting for discussion. We can never be sure what passes for truth these days. He sounds very genuine. Disaffected, I accept there are lots of sceptics on this subject. But as I said in my post, when asked if I believe in psychics, my reply is that I believe in Dennis as I have personally experienced HIS ability. I could never have done this if I did not believe in him. Wouldnt want to be as rude as MB but I simply dont go for all this stuff being true . Im sure there are people who are gifted at reading body language , picking up peoples vibes or simply asking the right questions to be able to give answers that either look amazingly accurate later on or even convince the gullable but I dont believe a word of it being somehow the work of someone ” in touch ” with those who have died. As a Catholic I believe that we go on but I certainly dont believe we hang around to speak to complete strangers , why would we . Im not surprised that youve taken it on as a job but I am surprised that you claim to believe it ! But there again it possibly helps sales !! Curmudgeon, my experience of Dennis is that he is amazing and very genuine, and there are countless people described in the book who feel the same way. As well you should be proud. Whether Mr. McKenzie is a rouge and a charlatan or whether he really is somehow gifted, you helped him craft his story into publishable form. That’s a great achievement for you. I hope it’s a runaway best-seller. But *ahem* I won’t venture any predictions! I’m curious to know who you are. Are you going to reveal your true identify or hide behind your anonymity while you make those kind of comments? I wonder why that is. I am proud of my achievements and my work. You’re the one with your CV, ‘academic’ (LOL) papers and ‘unique multi-media PR package’ puffed up on a personal webpage. A great example of style over substance. As for that po-mo psychic twaddle… oh dear. Monkey Boy, you sound very arrogant to me. You don’t even use your real name when posting a comment. Ghost writing and journalism are totally different styles of writing, btw. This is most definitely Dennis’ story with his personality and experiences providing the essence which makes it so compelling. pushing the boundaries of anti-intellectualism again. Total pseudo-scientific post-modern garbage.